This is College Physics Answers with Shaun Dychko. To find the total power of the headlight and the starter when they're connected in series, we'll take the voltage across them which we know, that's 12 volts, and we'll divide by the total resistance when they're connected in series. But to find the total resistance we need to figure out what the resistance is of each of these things. So the power consumed by the headlight is going to be the voltage across the headlight squared, divided by the headlight's resistance. We can solve this for R h by multiplying both sides by R H over P h. So we get R h is V squared over P h and this is in the regular case where they're in parallel. So this 12 volts is across the headlight and the 12 volts is also across the starter. 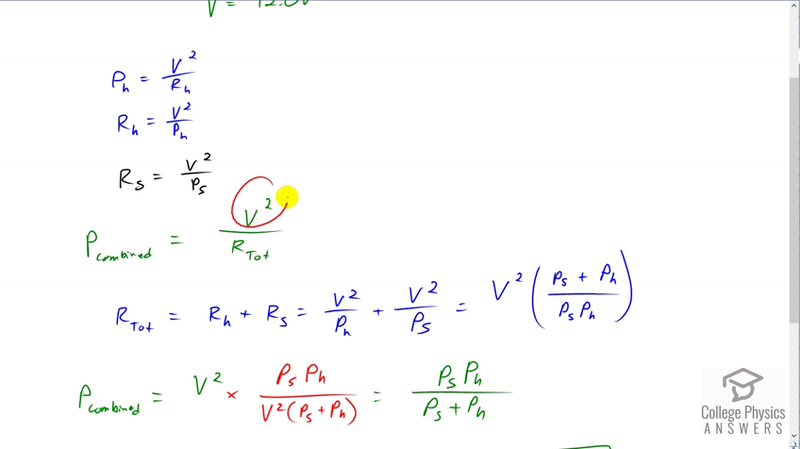 You can follow the same algebra and solve for R s equals V squared over P s, that's the resistance of the starter. So now we have the resistance of the headlight and the starter in terms of the voltage and the powers that they consume in the regular case when they're in parallel. So then we can substitute R s and R h by adding them together to find R total. So we have V squared over P h plus V squared over P s are the resistances for the headlight and the starter respectively. Factor out the V squared and then I just feel like writing this with a common denominator so I'll multiply this by P s over P s and I'll multiply this by P h over P h. Now they have a common denominator P s multiplied by P h. In the numerator we have P s plus P h and V squared is the common factor that we factored out. Then that's an expression for R total and so then we're going to divide V squared by the R total which means multiply by its reciprocal which is a neater way of writing it. I don't like to divide a fraction by a fraction so instead of putting a fraction in there I'm going to multiply by the reciprocal of that denominator. So we have V squared times P s times P h over V squared times P s plus P h. The V squareds cancel leaving us with the combined power is going to be the product of the powers when they're in parallel divided by the sum of their powers in parallel. So we have 2.4 times ten to the three watts, power of the starter, multiplied by 30 watts of the headlight, divided by the sum of those two powers. This gives 29.6 watts. We kind of expected the resulting power to be less than that of the headlight or less than the smallest thing because in combination their total resistance is going to be greater than the resistance of the thing with the biggest resistance which is the headlight. So with a thing -- with a circuit containing a greater resistance, we expect the power consumed to be less.